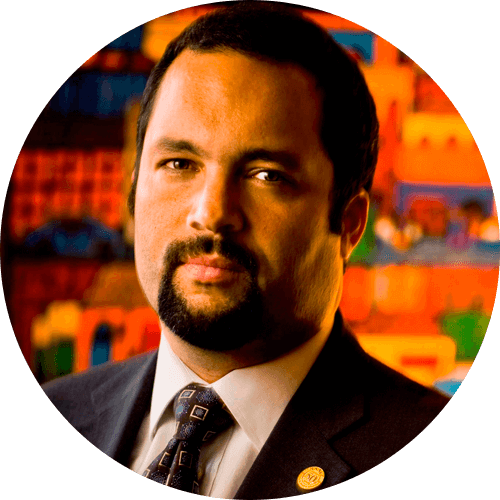 Ben Jealous is the former president and CEO of the NAACP. Jealous was elected to lead the NAACP in 2008. During his tenure, he focused the organization on voting rights and criminal justice reform and oversaw the launch of several national programs on education, health, and environmental justice. Jealous was the youngest person ever appointed to lead the organization and expanded the NAACP’s capacity to organize around issues pertaining to the economy and voter registration and mobilization. Jealous’ career began in 1991, when he served as a community organizer in Harlem with the NAACP Legal Defense Fund. Among his many achievements and accolades, Jealous was named one of Time‘s “40 Under 40? rising stars of American politics in 2010 and was recently designated as a young global leader by the World Economic Forum. In 2014, Jealous joined Kapor Capital, an Oakland-based firm that leverages the technology sector to create progressive social change, as well as the Center for American Progress, where he does research on political trends that affect civil and human rights.